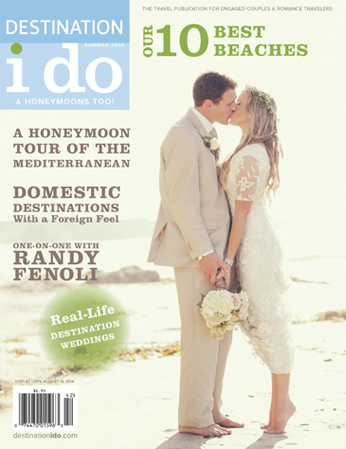 Our summer cover features one of our real wedding couples on the beach near their Santa Barbara reception location. Photography courtesy of Gideon Photography. Leave your passport at home with our U.S. Destinations with a Foreign Feel, or pack your chicest cowboy boots for our Rugged Retreats. Also get the inside scoop on hosting a classic American event in one of several Southern Charms. Perhaps you’ve got all your ducks in a row – you’ve found your dream destination wedding location and the honeymoon spot of your dreams…but there’s always time for real wedding inspiration! A constant crowd favorite, we arguably save the best for last with our Real Weddings.